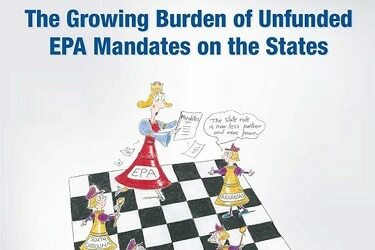 The relationship between the EPA and the states has devolved into an unsustainable system of underfunded program mandates. The U.S. Chamber of Commerce released a report detailing how the relationship between the U.S. Environmental Protection Agency and the states has devolved into a system where states are forced to implement an increasing number of federal environmental programs with progressively less money from federal sources. The U.S. Chamber finds that states administer 96.5 percent of all federally mandated environmental programs, but the federal government only grants on average 28 percent of the money needed to run the programs. Arizona receives only 13.4 percent of the overall budget needed to run environmental programs required by the federal government. The U.S. Chamber report provides seven recommendations to Congress to address this issue including redefining the term “mandate”; requiring agencies to analyze probable unfunded mandate impacts; enacting the Regulatory Accountability Act and several more. This study is just one of many reports the U.S. Chamber has released intended to hold government accountable for an increasingly complex web of environmental and technology regulations.